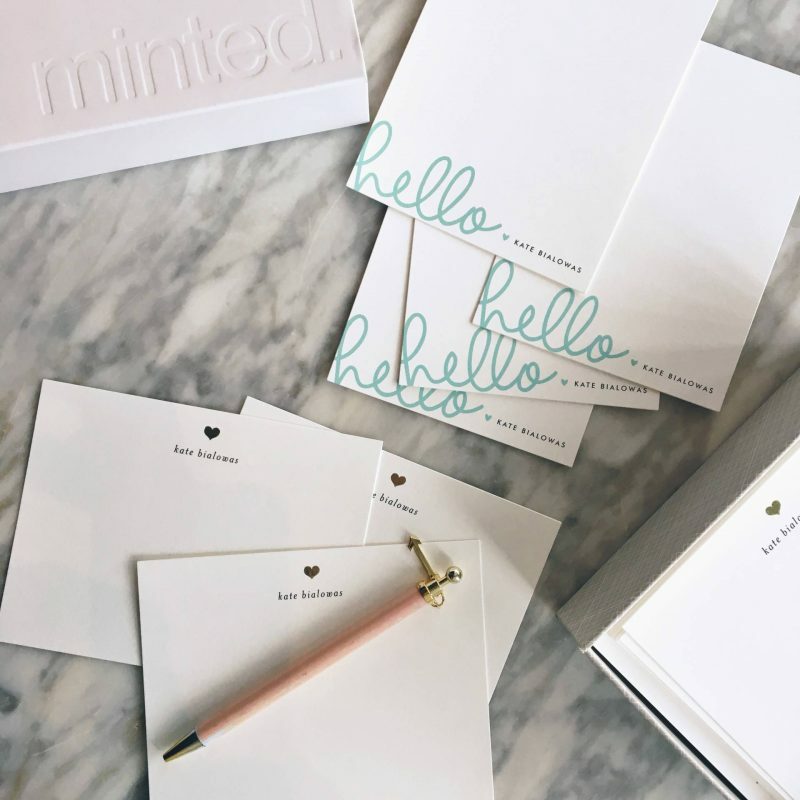 I wrote this post in collaboration with Minted. All opinions and comments are my own. I have a love/hate relationship with social media. 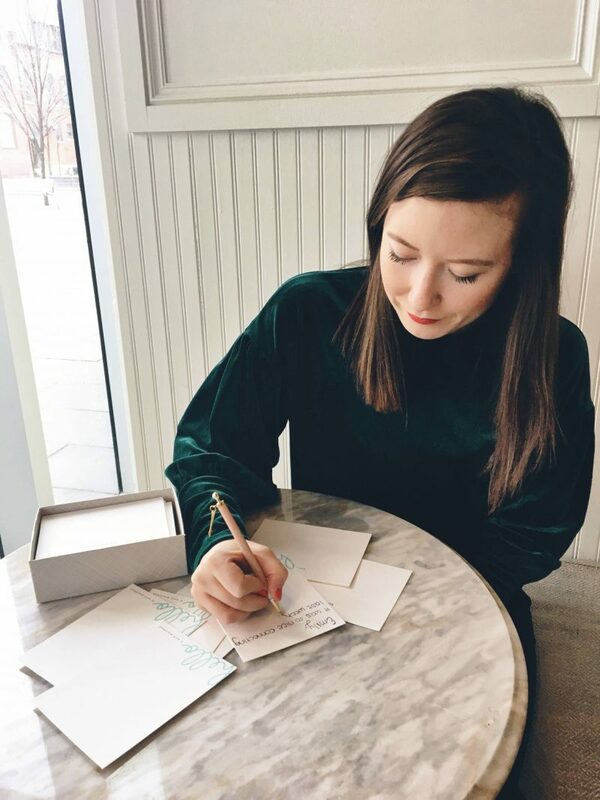 I love it because there are so many ways to connect with so many different people, and I truly think social media has given us so many opportunities that wouldn’t be possible without these connections. But social media has also made a lot of us much more introverted and to ourselves. Sometimes we’re more interested in what’s going on online than in the real world, and oftentimes having conversations with people over messaging apps replaces the real thing. So it’s important to know how to build offline connections in the digital age. There are ways to use social media to our advantage to connect with people offline. In fact, if you’re a regular reader around here, you might know I met my business partner Tracey through Instagram. Our first interactions and conversations were all done through Instagram, but now, hardly any of our relationship is done on social media – it’s mostly done in real life. And that’s what’s so great about social media. It can bring us together with people we didn’t know existed before, and introduce us to people who become our best friends. We need to move to offline interactions once we click on social media (if we’re in the same city, of course). There’s only so much brainstorming and connecting you can do through social media. Bringing my online friendships offline has allowed me to connect with so many amazing and like-minded individuals. All it takes is you putting yourself out there and asking someone to meet up for coffee. 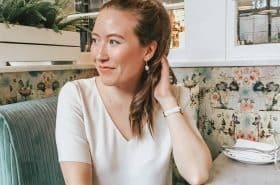 Below are some of my favourite ways to connect offline in the age of social media. 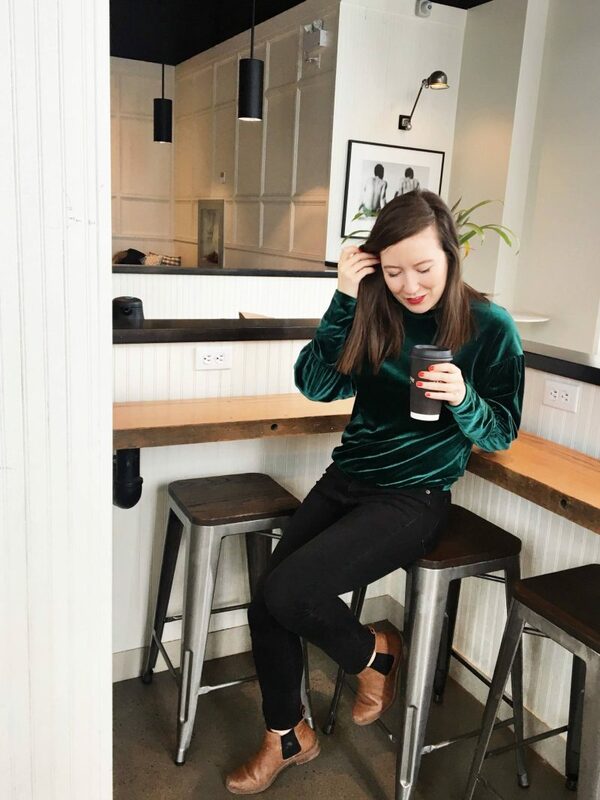 I love, love, love meeting up for coffee with fellow bloggers, entrepreneurs, and creatives. It’s such a great way to bounce ideas off each other, get inspired and learn as much as you possibly can about so many different topics. Everyone you meet has their own goals and interests, and each person has their own unique story. When you meet someone one-on-one for coffee, you really get to know each other. Some people you click with right away, others not as much. And that’s totally okay. It’s still interesting to meet with as many people as you can to learn about other view points and learn how to get along with different personalities. Do networking events make you uncomfortable? Good, then you should go to one by yourself. Over the past few years I’ve been doing things that are out of my comfort zone. If someone asks me if I want to attend an event on my own, if it makes me feel uncomfortable (for no other reason other than that I’m shy), I say yes. How can we ever grow if we never step outside of our comfy little bubble? Plus, you never know who you’ll meet or connect with. You never know who might know someone or be able to connect you with someone you’ve always wanted to meet. 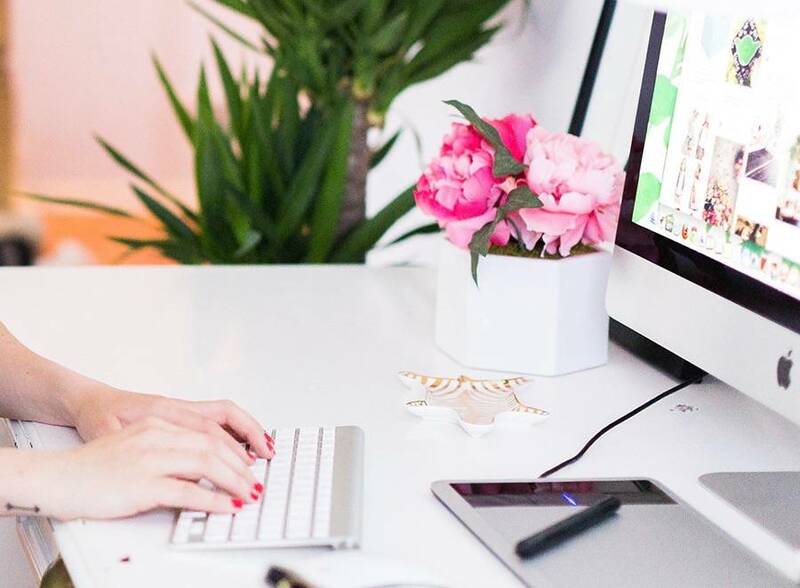 Staying behind your laptop or smartphone can only get you so far when it comes to forming connections and growing as a person or as a brand. You need to put yourself out there and attend these events to foster meaningful relationships. If you work from home, or work from an office and immediately go home and stay in all night, try to switch it up. You never know who you’ll meet or run into when you’re working from a café or taking a yoga class. Getting out of your house opens you up to so many possibilities you don’t even know exist. Now that I think about it, almost every time I do work from a café, or go to the gym or a yoga class, I’ll run into someone I know. It’s so nice to actually catch up with people offline! It’s always so special when you get a card addressed to you in your mailbox, isn’t it? Not your email account, not over Facebook, but a real card you can put up on your fridge or mantel, or pin up on a cork board. And it doesn’t happen enough anymore. 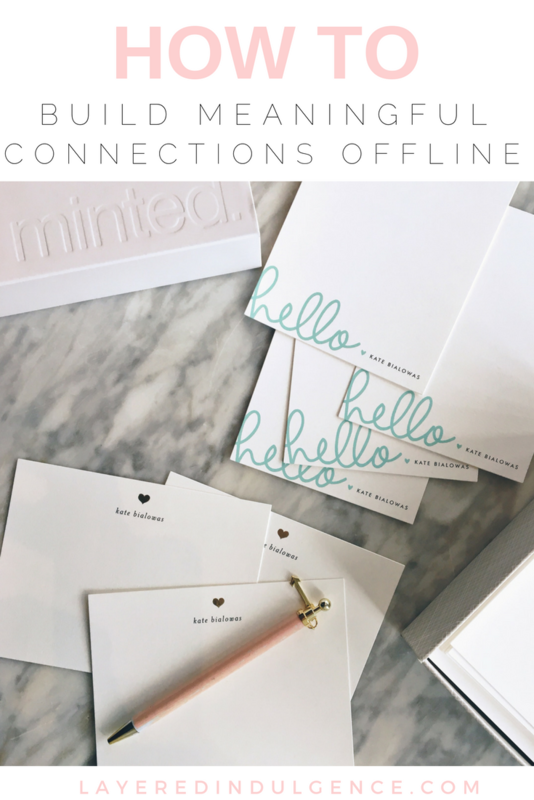 I collaborated with Minted on these customized stationery cards from their foil-pressed collection. I’m completely in love. Minted is a platform that connects consumers with independent artists for unique designs you can’t find anywhere else. From wall art to home décor and the most gorgeous paperie shop, it’s THE place to go if you want to find gorgeous pieces for your home, celebrations or building offline connections. 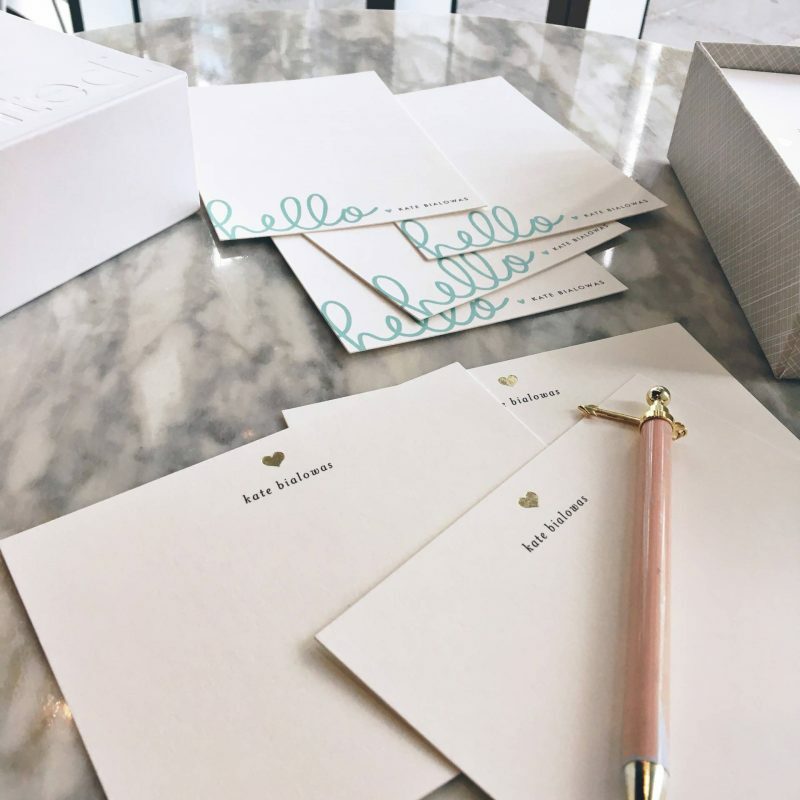 When I laid my eyes on the Handwritten Hello personalized stationery and the For Heart’s Sake foil-pressed stationery, I knew these designs were perfect for my new mission to stay in touch with those I meet and click with! As an entrepreneur, I go to a lot of coffee meetings and networking events, and now I can follow up with these beautiful cards. 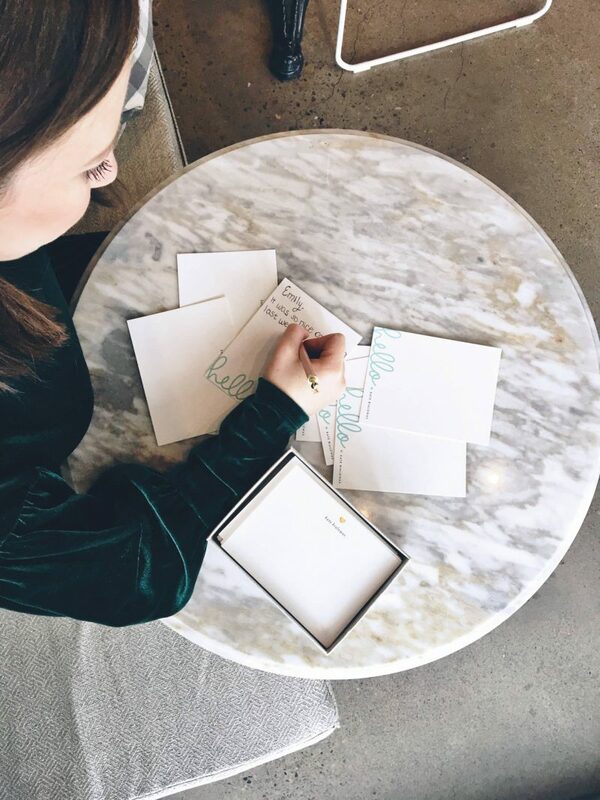 Taking the time to hand-write a card is so much more meaningful than typing up an email or sending a DM on Instagram, and especially since we’re heading into the holiday season, it’s the perfect way to let others know you’re thinking of them. Following up with someone means you care care enough to continue with the relationship, and if you’re looking to form more meaningful connections offline, you need to follow up with people. A quick note to let them know how much you enjoyed your chat and that you’d love to meet up again will make them feel so special! 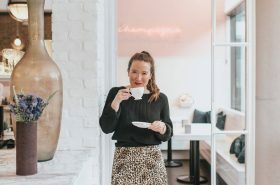 There are definitely pros and cons to social media, but if we use it to our advantage and take our online connections offline, we have the potential to meet new business partners, collaborators, and friends. Getting yourself out there is the first step, but following up in a meaningful way is just as important! How are you going to build your offline connections and follow up with people this holiday season? Let me know your best ideas below! And if you loved this post, make sure to share the pin below on Pinterest! Ok, let’s talk about that stationary first. HOW ADORABLE!! I really want some now!! And it makes correspondence look SO much more professional! During the holiday season, I love sending Christmas cards to people like my supervisor from my Master’s or previous supervisors from work. People don’t send mail anymore so it has a big impact. I’ve also started sending birthday cards (if I remember) and that also helps forge friendships and build relationships. This post was so great! I definitely need to connect more offline. I went to a networking event last weekend and it was super fun getting to talk with other creatives. Such a great post. Thanks Kierra! And that’s so awesome, I’m so happy it was a great experience, I definitely need to do more of those! 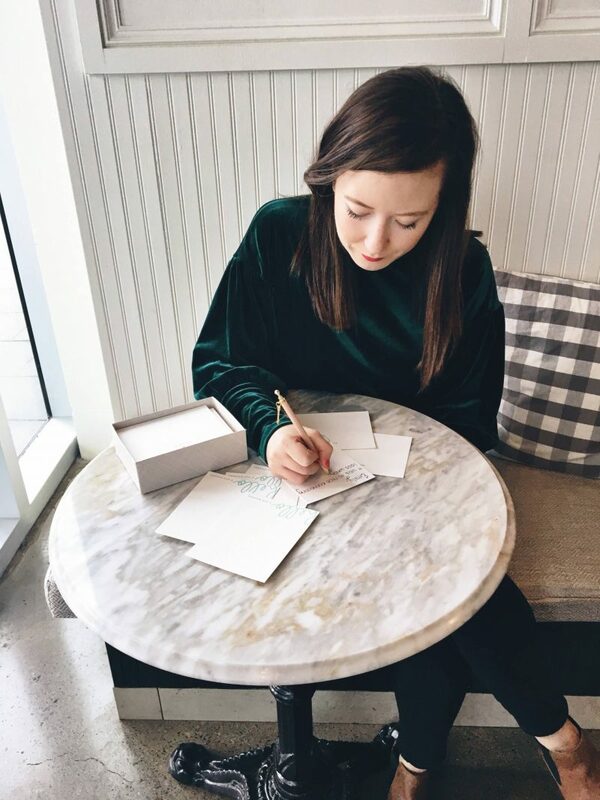 It’s so great to connect with other creatives and bloggers! Love it! It’s so true. I feel like social media is all about the first impression but ultimately, you can’t really build any relationship online as it does take time and effort. Such a good article babe! I love thiiiis! I totally agree, I have the same love/hate relationship with social media. I find myself buried in the online world all too often, and not connecting with the outdoors. So I’ve been making an effort to leave my house often and go explore! At the same time social media is amazing, because I’ve also been able to meet people in real life through blogging. It’s important when to know the limit, like you said meet for coffee and get out of the house. I love that you mentioned networking, I’m interested in going to some events when I get back to the states but I’m pretty apprehensive about it. But like you said- life begins outside our comfort zone! I loved this article and all you say is true! It’s been so much fun to meet you in person, over coffee, and to keep in touch and learn from each other.